2.9.18: Quite day. Our line ran S14a 3.5, 58c 4.0, S8a 05.65, S1db 8.1, X6C 90.45. 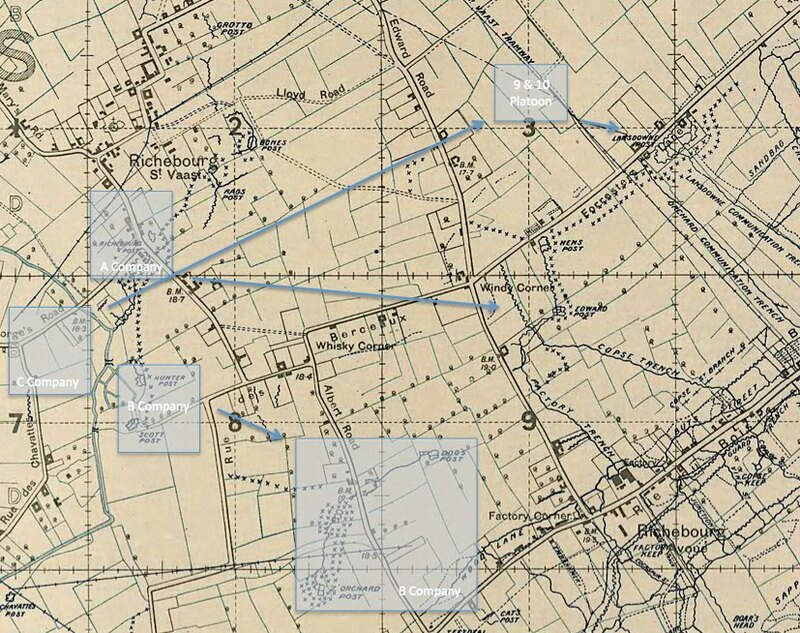 3.9.18: A successful operation was carried out resulting in the capture of our objectives and a few prisoners. 4.9.18: Another operation was successfully carried out. 5.9.18: Artillery active over the whole area. 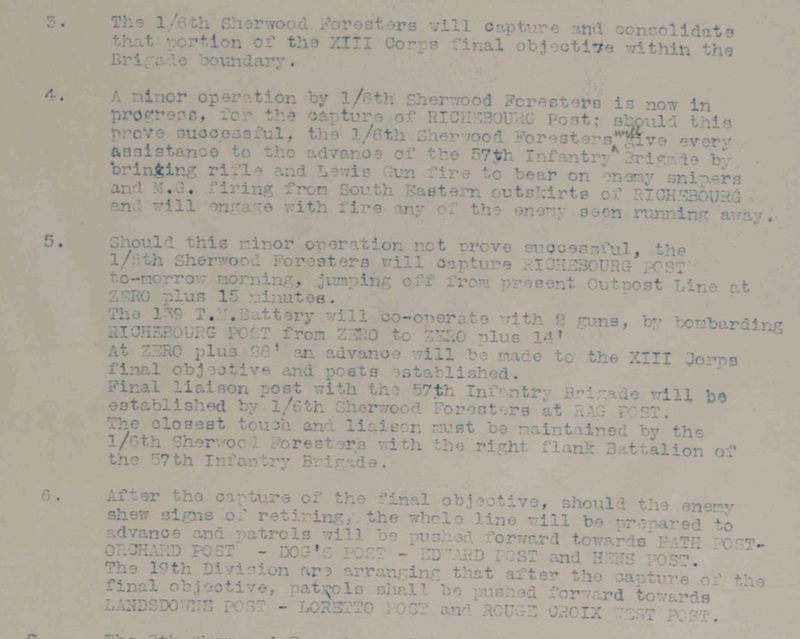 One shell hit HQ of 8th Sherwood Foresters and wounded Lieut Col.- RW CURRIN DSO and all his HQ staff, with the exception of his 2nd in Command. Night 5th/6th relieved by 56th Division. 1769/73444 L/Cpl Harold Marsh aged 23 and the son of Ben and Mary Hannah Marsh; husband of Fanny Marsh of 3 Station Rd. Spa Lane in Chesterfield. Harold was a pre-War Territorial who enlisted in 1912 and arrived in France with the 46th Division in February 1915. He was wounded in 1915 and returned to England for treatment. 20043/269262 Pte. Charles Norman Comins aged 23 and son of the late Charles and Mary Jane Comins of Lincoln. Charles had previously served with the 1/7th Battalion. 93551 Pte. Frederick William Clay from Leek in Staffordshire. Frederick was a conscripted soldier who only served in France with the 1/6th Battalion. 31847 Pte Francis William Dennis from Leabrooks in Derbyshire. Had previously served with the 16th Battalion. 3815/266206 Pte. Albert Owen Hewson aged 21 and the Son of the late George Edward and Sarah Jane Hewson of 4 Harrington Drive on Derby Rd. in Nottingham. Had previously served with the 1/7th Battalion and arrived in France in 1916. 3642/241152 Pte Joe Maxwell Moore aged 25 and the son of Harry and Sabine Moore of Whaley Common in Langwith Derbyshire. 1699/240220 Sergt. George William Wall the son of William Wall of North Wood in Darley Dale Matlock. George was a pre-War Territorial who had enlisted in May 1912 and arrived in France with the 46th Division in February 1915. 1537/240149 Cpl. Archibald Galbraith aged 28 and son of Thomas and Emily Galbraith; husband of E Galbraith of 21 Market St. Whaley Bridge. Archibald was a pre-War Territorial who had enlisted in January 1912 and arrived in France with the 46th Division in February 1915. 2879/240778 Pte. Richard Milnes wounded by a bullet on the 4th September and died in the 22 Casualty Clearing Station 10 days later. Richard enlisted in October 1914 and arrived in France with the 46th Division in February 1915. This entry was posted in Casualties, On this day and tagged 1537/240149 Cpl. Archibald Galbraith, 1699/240220 Sergt. George William Wall, 1769/73444 L/Cpl Harold Marsh, 20043/269262 Pte. Charles Norman Comins, 2879/240778 Pte. Richard Milnes, 31847 Pte Francis William Dennis, 3642/241152 Pte Joe Maxwell Moore, 3815/266206 Pte. Albert Owen Hewson, 93551 Pte. Frederick William Clay, Richard William Currin on September 17, 2017 by mikebriggs1910.